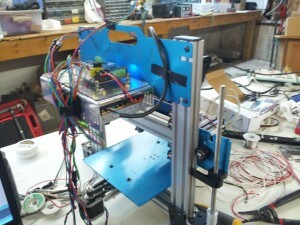 I’ve been neglecting my ord bot build for awhile, but I’ve finally made some progress. First of all let me explain something. Aside from the hardon platform, I really didn’t want to follow any templates. I just figured I’d order a bunch of parts and figure things out as I go. If I wanted instructions to put X in Y I would have bought a full kit. With that out of the way — I decided to start mounting the electronics. I played with the idea of putting the power supply under the platform. I think that for weight distribution it would be nice under there. I don’t remember exactly (as I’m playing catch up with posts at the moment) but I decided not to. So second choice is to mount the power supply to the main brace with the handle. Which conveniently has lots of mounting holes in it already. Again weight distribution in mind, it should lay flat, but that would have taken all my real estate for mounting stuff to it. So I ended up mounting the power supply vertical and using it as a shelf for my controller. I figured why not. I started out with some acrylic I had laying around and drilled some holes to mount some standoffs from the power supply. Then I did some more standoffs for the actual Azteeg X3 controller. Finally, I think I had to drill 1 hole to mount the power supply to the board (I re-used one existing hole). I’m actually happy with the way it turned out. It does make the back end a little heavy but I don’t think it will affect anything much. For now I’m just twisting and taping the wiring so I can get a feel for how long things need to be and mounting. I’ve actually made more progress, but I wanted to break each part up in sections. The Azteeg X3 has so many options, whats the bare minimum to work with the ORD bot? The ORD bot design doesn’t need anything special. You’re right the Azteeg X3 has a lot of options! I guess the minimum requirements are the same as any rep-rap, with the exception of the dual z axis drivers. So that would be 5 stepper drivers, X, Y, (dual Z), and an (a single) extruder. I belive the Azteeg supports 8. The rest is pretty standard, 2 heaters, 1 for the bed, 1 for the nozzle, 3 home endstops, and 2 thermocouple ports (1 for the bed, 1 for the nozzle).